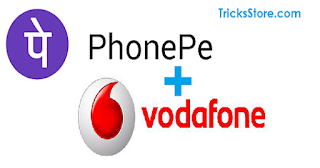 phonepe, Get 10% Cashback on Vodafone, Vodafone 121 Made For You Plan, Vodafone Recharge Offer, Phone Pe Recharege Offers – Hello Guys, Vodafone users it’s not too late now cashback offer is for you guys. We all are aware with Vodafone 121 Made for you plans. And PhonePe is giving Offer on vodafone plans. We know that you are enjoying our Free Recharge Tricks. Now for our valuable readers we are back with another phone pe wallet new user offer, now get free cashback on phone pe without any phonepe coupon/ promo code. Hurry !! Just wait You will get flat 10% cashback upto Rs 60 instantly in your phone pe wallet. * In case the PhonePe wallet limit for the month has been reached(₹10000), the cashback will be credited on the first business day of the next month. *Offer is applicable to IOS and Android devicesCashback gift voucher can be used for recharges, bill payments and payments on PhonePe partner platforms/stores. *The transaction must be initiated and completed by the user within the PhonePe apply cashback related queries should be raised within 30 days, post a successful transaction. * Phone pe has the right to amend the terms & conditions, end the offer, or call back any or all of its offers without prior notice. In case of any dispute contact Phone pe customer care.